Hi Jerks, it's time for ice cream. Ice cream is delicious. Cake is delicious. And we all know how great it is when you combine the two. Today, we take it to the next level. I've taken an ice cream creation icon...and turned it into a cake. An ice cream cake to be exact. I'm not even sure how the Universe is still in place. 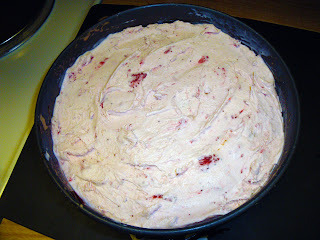 Ladies and gentleman, I present to you, the recipe for a Banana Split ice cream cake. As I list the ingredients needed, please remember that anything worth being tasty must have quality ingredients. I will list what brands I used, however you are more than welcome to use lesser/higher quality ingredients based on your preference! Also, this recipe is extremely easy, but takes time to make (as each layer must be frozen before another layer can be added). This recipe would be better suited made the day before it is needed. 1. Preheat oven to 350F. In a plastic bag, finely crush cookies with a rolling pin. 2. In 9x3 springform pan, with fork, stir cookie crumbs and melted butter until evenly moistened. Press cookie mixture firmly onto bottom of pan. Bake until crust is slightly darker on the edges (about 12-14 minutes). Place crust in freezer for about 30 minutes. 3. Meanwhile, place the vanilla ice cream in the fridge to soften it. This will take about 30 minutes. 4. Once crust is frozen and vanilla ice cream is soft, evenly spread the vanilla ice cream over the crust. Cover and freeze until firm (about 45 minutes). 5. Get your bananas and fudge ready (exciting, I know!). 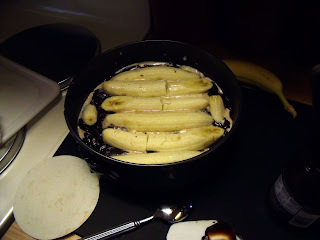 Cut 3 bananas lengthwise in half. Pour fudge sauce over the ice cream. This can be tricky as you may have to warm the fudge slightly so it will spread easier, however the warmer it is, the faster it will cause the ice cream to melt so you will have to work fast here. Now, arrange the bananas on top in a neat little row. Freeze cake for about 1 hour now. This will get the fudge to freeze throughly. Meanwhile, place the chocolate ice cream in the fridge to soften (again, about 30 minutes). Cover and freeze until firm (about 30 min). Meanwhile, place the strawberry ice cream in the fridge to soften. 7. Spread the strawberry ice cream evenly over the chocolate ice cream. Cover and freeze until firm, about 3 hours and/or up to 2 days. 8. To serve, in small bowl with a mixer set to a medium speed, beat whipping cream until soft peaks form. Cut remaining banana into 1/2 inch slice at an angle. Next, dip a small knife in hot water, shake off the excess water, then run knife around the edge of the pan to loosen the cake. Unhinge the springform pan to free the cake. Put whipped cream on top of cake and arrange the banana slices on top. Sprinkle the nuts and maraschinos. Let stand at room temperature for about 10-15 minutes before slicing.